International health experts have agreed an outline global strategy to tackle bird flu. The plan, which could cost $1bn (£573m) over three years, focuses on fighting the lethal strain of the virus in birds and improving countries' preparedness. Experts warned that it remained essential for countries to develop and rehearse plans to deal with a pandemic. They also said developing vaccines and boosting production of anti-viral medicines could cost $500m. Earlier this week, the World Bank said that a pandemic could cost the global economy $800bn. The measures, announced at the end of a three-day conference in Geneva, called for an immediate improvement in animal health surveillance. Experts said every dead or dying bird should be investigated and the results reported within 24 hours, and that countries must improve their disease early-warning system and share information about suspected outbreaks with one another. They also warned that countries also needed to develop and rehearse plans to deal with a flu pandemic, for example deciding whether schools would be closed, and who would get anti-flu drugs when there were not enough for everybody. "Once a pandemic virus appears, it will be too late," the head of the World Health Organization (WHO), Lee Jong-wook, said. The World Bank says it hopes to help raise the $1bn at a pledging conference in Beijing in January. The proposals have huge implications for Asian and African countries, where backyard farming is common, vets are in short supply and health services are weak, says the BBC's Imogen Foulkes in Geneva. More than 60 people have died of bird flu in Asia since the disease broke out in 2003. 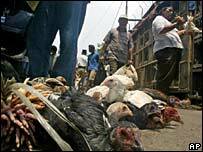 Bird flu: Still a threat?